Hundreds of puzzles, 3100+ words and unlimited fun! Discover an entertaining way to exercise your Bible vocabulary! 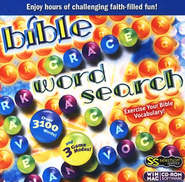 Enjoy hundres of fun word search puzzles based on the people, places and stories of the Bible! System requirements: Windows 7, Vista, Mac 0S 10.3 and above.